There are a number of reasons why you might want to make the best use of space in your kitchen. Limited cabinet space, or small counters, could be the problem. Sometimes the reason is that the kitchen is just plain small, to begin with, so you need to be inventive with your kitchen decorating ideas. When your kitchen has limited space, you can still be creative with your kitchen decorating ideas to get the most out of that space. Here are two neat and very practical ideas that will spruce up the decorative look of your kitchen, plus free up some area so you can get cooking. You’re probably going to want to add a little visual flair to your kitchen decorating ideas at the same time you free up some space. If didn’t care what your kitchen looked like, then why not just stack a bunch of portable cabinets or shelves on top of one another and be done with? That would certainly meet the objective of prudent use of a small space, but it would be very decorative. These ideas do both; make use of a smaller than normal kitchen, plus add a little charismatic charm. One of the most notorious occupiers of kitchen cabinet space is pots, pans and their lids. Not only do they rarely seem to fit in any cabinet, or kitchen drawer. When they do, they clang around, never seem to stack well, making it a chore just to get out the one you want. Many kitchen pot and pan designs are also quite eloquent, so why stuff them away in a cabinet. Hanging them decoratively around your kitchen gets them out of the way. Plus, using some of the kitchen decorating ideas for hanging pots and pans can be a neat way to spruce up the space using. The design of your kitchen will dictate what type of hanging system works best. If you have a great deal of open ceiling space, free hanging versions are really cool. You can center them over your stove or cooking area. You can shift them off to a corner for situations where the ceilings are too low. There are wall units, and even standing holders if you have extra counter space, but not so much in the area of cabinets. To be extra creative with your kitchen decorating ideas, you can make your own using plans from a number of do-it-yourself sites. Imagine the visual creativeness you could exude up cycling an old wooden ladder, or inverted antique window, hanging from your ceiling as a horizontal pot rack. One of the most unusual pot hanger designs was made from a collection of deer antlers mounted on the wall. What a way to free up kitchen space, plus let guests see the spoils of your hunting prowess. 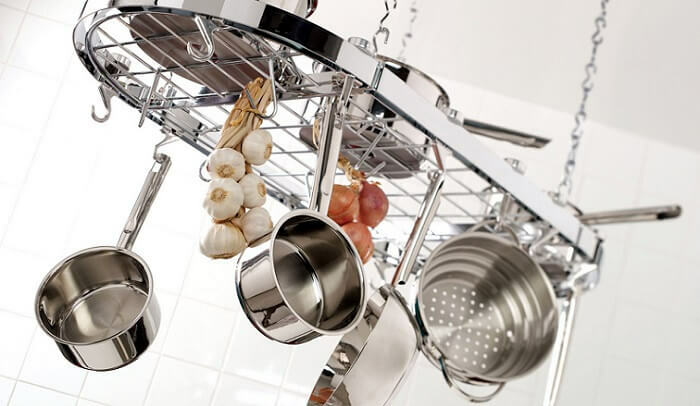 No matter which design concept you choose, hanging your pots and pans is one of the best ways to generate free space in a kitchen with limited space. Let’s say you managed to find a perfect way to hang all your pots and pans. The next biggest headache coming up with kitchen decorating ideas using limited space is all the lids that go with those pots and pans. Sure, you could put them inside a cabinet or drawer, but you’ll experience the same headaches you had with the pots. How in the world do you find the one you want, without digging through a stack of noisy lids? Build or buy a rack and put them up on the wall. Following the same idea as the pots and pans, the lids that go with them are usually neat designs. Even they are basic kitchenware; they still present a space problem when space is an issue. A neat way to get them out of the way and keep them neatly organized is to line them up on a rack. One suggested alternative is something along the lines of the frames built to stack vinyl records. 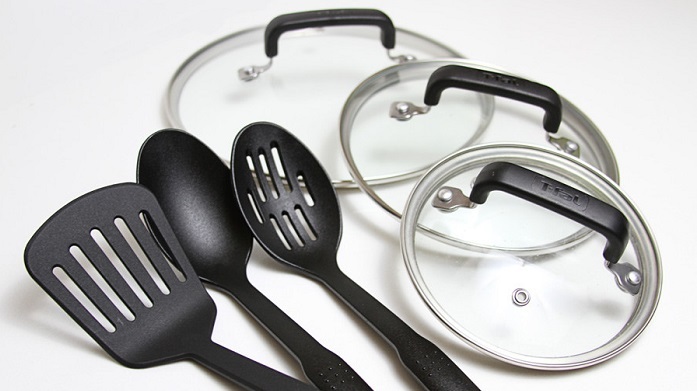 Since pot and pan lids are usually different sizes, sometimes it’s best to calculate some measurements and take your idea to someone who makes kitchen cabinets. Another big problem with small kitchens is countertop space. You can either add more, or make better use of what you have. While the pot and pan idea is great for generating useful cabinet space, clearing off the counters is another important concept because open counters make the kitchen appear bigger. Once again, you could just pile things up in the corner to clear off the countertops. 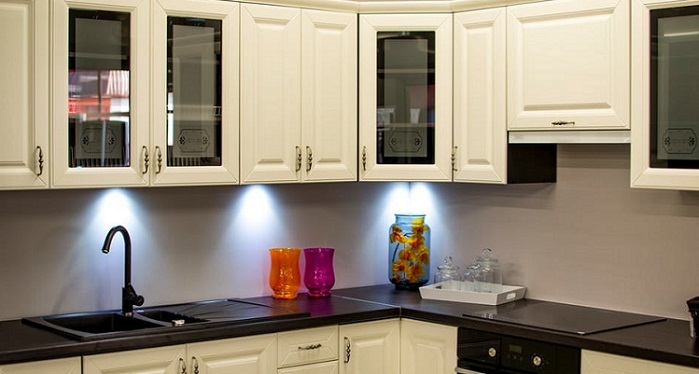 However, like most people you would prefer to keep your kitchen as decoratively appealing as possible. 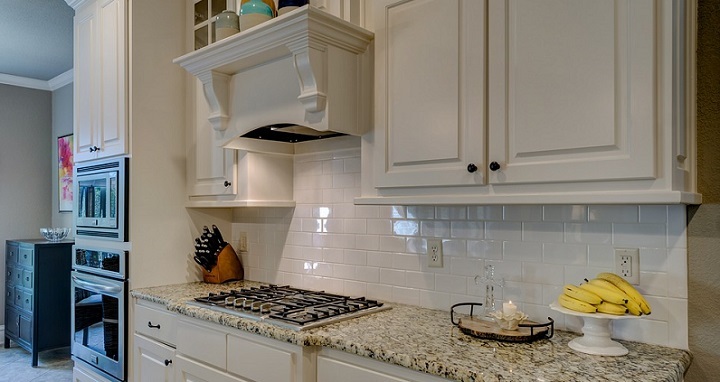 One way to accomplish that is to try to keep countertops as clear as possible. Sure, you can only make do with what you have, but here’s a couple ideas to reach that goal. When you sweep away the countertop clutter, you add workable space to your small kitchen, plus gain the advantage of the visual appeal of an open area. Just don’t throw everything into tubs or on shelves, get creative. Adding some portable cabinets, or putting a unique space-saving rack on the wall, is another neat way to make use of limited kitchen space. Rolling counters are a super option for small kitchens. You can neatly roll them out of the way when you are not using them, but they are easily accessible when you do need more space. There are antique baker’s racks – also called Hoosier cabinets – portable cutting boards, and cabinet designs on wheels. These are ways to add usable cabinet space, plus open up your kitchen by clearing away clutter. While the kitchen decorating idea of adding another piece of furniture to your small kitchen might seem counterproductive, in the end the visuals of an empty space actually make your small kitchen appear bigger. Since the pots and pans, you cook with – plus their annoying lids – absorb a lot of cabinet space, they are a great place to start. Applying some kitchen decorating ideas to hang them, frees up needed kitchen space, plus can add a unique flare to your kitchen. Finally, sweep those counters clean to gain both the visual perspective of a bigger space, plus do the same thing; add a little pizzazz to your kitchen décor.